Pythagorean numbers and Moon in Greek myths. The fourth page describes characteristics of Greek gods who correspond to numbers 2 and 8 of Pythagorean numerology, also correspond with astronomical compositions of Moon and Sun in myths of Ancient Greece. Information of this page can be interesting not only for people who are interested by ancient esoteric conceptions of Pythagorean numerology or modern occult theories about mystical values of numbers, but also for researchers and scientific experts who study astrology and cosmology. Because Greek gods in myths correspond not only to values of numbers, but also astronomical parameters of heavenly bodies in space of solar system. Numerology and Greek gods in myths. Pythagorean numerological numbers 2 and 8. To numbers 2 and 8 in the context of Pythagorean numerology there correspond Greek gods Apollo and Artemis who were born as children of Leto and Zeus. Apollo and Artemis were born as illegal children of Zeus, and consequently Leto is competitor of Hera who in hierarchy of Olympic pantheon is lawful wife of predominating god. Both Greek goddesses correspond with Pythagorean numerological number 4 and personify images of mothers which have become famous by means of own children. Hephaestus and Ares as children of Hera are rational deities, namely Greek gods which are connected with logic and ethical functions of consciousness. Apollo and Artemis as children of Leto are irrational deities, namely Greek gods which are connected with intuitive and sensory functions of consciousness. Artemis is connected with sensory function, but she is sister-twin of Apollo and consequently operates in sphere of own brother, namely this Greek goddess displays as deity of intuition. Link of Artemis with intuition corresponds to rules of analytical numerology about which look information on pages of this website in other section where names of Greek gods are compared to psychological types of people. Four mental functions of consciousness were formed owing to Hera as a result of occurrence of discrete material substance in cosmic space of ethereal reality of universe, that is in detail described on second page in this section of website. But also Leto is the reason for formation of four mental functions which became rational and irrational as a result of existence of this goddess in hierarchical structure of Supreme deities of Olympic mythological pantheon. Namely children of Hera are rational or otherwise to tell pragmatic deities which in the context of Greek mythology personify technical progress and competition. Because Hephaestus is mythological smith, and partner of Ares is Eris who displays not only as goddess of contention but also as personification of industrial and economic competition. But children of Leto are irrational or otherwise to tell idealistic deities which personify creativity and love of nature. Because Apollo is irrational god of fine arts and creativity, also his sister Artemis is idealistic goddess of nature. Leto is proud by acts of own children and gives freedom of actions. Hera supervises actions and demands execution of maternal commands, also punishes and directly interferes in affairs of children. Hephaestus has been punished and overthrown by Hera on ground, as logical function of consciousness is rational. Ares has been wounded by Athena and too plunged on ground, as ethical function of consciousness too is rational. Apollo and Artemis were born on floating island because Hera has forbidden Leto to go into firm ground, as intuitive and sensory functions of consciousness are irrational. Hera as lawful spouse Zeus jealously pursues Leto as illegal competitor, but children of both mothers are necessary for the main Greek god of Olympic pantheon. Therefore Leto is in hierarchy of Olympic gods under protection of Zeus, also under defense of Apollo and Artemis. Apollo is Greek mythological god of fine arts and creative inspiration. Apollo teaches people to music and other fine arts, also he is divine leader of nine Olympic muses who personify creative inspiration of poets and artists. Creative fine arts for Apollo are sense of existence and great value of world validity, that contradicts outlook of Supreme Olympic gods of Greek mythology. Because Zeus perceives fine arts as intellectual resource which is necessary for formation of unitized social ideology and totalitarian culture, and in essence as artificial decoration of cultural society. Therefore creative potential of Apollo is focused on creation of official engaged fine arts which are necessary for Zeus for eulogy and glorification of supreme authority of Olympic gods. But between Zeus and Apollo there are conflicts if art works deny notations of Supreme Olympic gods about norms of official culture and tendentious social ideology. Son of Apollo was singer Orpheus who fascinated people and gods by means of singing art. In particular Orpheus by art of singing has fascinated Persephone who is spouse of Hades, when he wished to return Eurydice from empire of dead. But however Orpheus could not release Eurydice from inevitable ties of death, and as a result exciting singer has lost object of own love passion. Apollo too like Orpheus is enamored by nymph Daphne who has sworn to store chastity and cannot reciprocate feelings, that corresponds to numerological principle of number 8 which symbolizes not only fine arts and creative inspiration, but also aspiration to ideal love which cannot be reached. Therefore associates of Apollo are muses who personify creativity. Also elects of Apollo are poets and musicians who are noted by creative inspiration and aspiration to celestial ideal, namely aspiration to idealistic perfection in music and poetry. Apollo possesses powerful will which rules over forces of nature, and consequently this Greek god allows to create harmony of sounds in music, or harmonious combinations of words and poetic images in poems which are genuine art works. Also powerful will of Apollo is force which punishes musicians and poets in the event if music or poetry has no aspiration to ideal perfection, namely if musical or poetic art works deny criteria of genuine art. Apollo is father of Asclepius who is Greek god of medicine. And Apollo itself is capable to treat people, because creative inspiration changes psycho-physiological parameters of organic human bodies and cures illnesses. Alongside with creative inspiration Apollo possesses gift of prophecy and divination. He helps people to find own destiny, also this mythological Greek god teaches art of divination and prophecy, and in particular his prophetic talent was known for Cassandra and Sybil. Also Apollo possesses Delphic Oracle which announces events of future time and informs divine will of Olympic gods to people. Zeus and other deities of Olympic pantheon supervise events of human life, and consequently Delphic Oracle announces divine will to people. But however gods cannot predetermine events of future time because original human destiny is not governed by will of Zeus or others divine essences of ethereal reality, but any fatal lot depends from relentless moiraes who exist in celestial sphere of ideal shapes of primary potentialities of universe. Contrast or otherwise to tell alternative to Apollo in the context of Greek mythology is Dionysus who too corresponds to number 8 of Pythagorean numerology. Dionysus is son of Zeus and Demeter, also brother of Persephone. Demeter as mother is Greek goddess of fertility, and Persephone as sister personifies spring awakening of animate nature and growth of plants. Therefore Dionysus in myths of Ancient Greece has indirect association with flora and fauna, also he is mythological god of winemaking. Dionysus and Persephone are brother and sister who correspond with numerological numbers 8 and 2. Namely they are commensurable with Apollo and Artemis which too correspond with numerological numbers 8 and 2. But distinction consists that parental origins of these Greek gods are connected with different numbers of Pythagorean numerology. Zeus and Leto as parents of Apollo and Artemis correspond to numbers 6 and 4. Zeus and Demeter as parents of Dionysus and Persephone correspond to number 6. Or in myths of Ancient Greece there is information that Dionysus is son of Zeus and terrestrial woman Semele who because of artful intrigue of Hera has been destroyed by lightning of main Olympic god, and so Dionysus was born as premature infant, but has been reared by nymphs. Various parents of Dionysus are specified in different Greek myths. But in any case his sister Persephone or nymphs as teachers in the context of Pythagorean numerology correspond to number 2 which is connected with deities of nature and plants, that defines indirect association of Dionysus with flora and fauna. Just as Artemis defines indirect association of Apollo with flora and fauna. Dionysus as Greek god of winemaking is contrast or return display of Apollo. Because Apollo is personification of creative inspiration, but mythological image of Dionysus personifies sensual ecstasy or intoxication, however other characteristics of two Greek gods are similar and correspond with number 8 of Pythagorean numerology. Apollo is the source of fine arts and harmonious music. Dionysus instead of fine arts and harmonious music prefers dissolute songs and licentious festivals. Satellites of Dionysus are satyrs and bacchantes who possess violent tempers and love sexual orgies during which drink wine and eat crude meat of animals. Also satellites of Dionysus are muses. In particular satellites of Dionysus are ancient muses or kastalides who have informal status in hierarchy of Olympic gods as occur from Uranus and primary potentialities of universe. Namely ancient kastalides which possess other qualities rather than official Olympic muses or pierides which are daughters of Zeus and retinues of Apollo. Also satellites of Dionysus are ancient muses or aonides which were born as children of titans and too have informal status in hierarchy of Olympic gods. Because aonides possess other qualities rather than official Olympic muses or hippocrenides which are daughters of Poseidon and retinues of Apollo. Informal muses of Dionysus are sources of imaginative ecstasy as a result of which there is showy popular arts which are pleasant for wide social audience. Official muses of Apollo are sources of creative inspiration as a result of which there are fine arts which are pleasant for connoisseurs of music or poetry. Dionysus contradicts stable world order of Supreme Olympic gods as intoxication conducts to degradation of public moral norms. But however existence of Dionysus in hierarchy of Olympic gods is authorized by Zeus, because intoxication is abnormal condition of consciousness and distracts people from comprehension of true world validity, that is necessary for preservation of supreme divine authority and constant stability of mythological deities. Dionysus as mythological deity of winemaking is equivalent of Bacchus in Roman mythology. Also Dionysus corresponds with Liber who personified liberal social ideology of ancient Rome. Artemis is daughter of Zeus and Leto, also sister of Apollo. Artemis is Greek goddess of animalistic wildlife, namely she personifies spiritual unification with flora and animals. Artemis rules over behavior of animals and vital forces of nature, also she is mistress of wood and goddess of hunting. Artemis possesses resolute character as personification of she-bear, also she protects ecology of biosphere and resists to environmental contamination. This Greek goddess in Roman mythology is identical to Diana who was divine sovereign of flora and fauna, or otherwise to tell governor of natural plants and wildlife animals. Retinues of Artemis are nymphs who are deities of trees, rivers and lakes. Also satellites of Artemis are various zoomorphic deities which personify vital forces of nature and existence of alive essences according to biological laws. Demeter as goddess of fertility personifies selection of agricultural plants and cultivation of fruiters, but Artemis is Greek goddess of wild-growing flowers and grasses. Apollo as brother of Artemis personifies cultural plants which grow in gardens and parks, namely are products of gardening art, but Artemis is Greek goddess of natural vegetation and original landscapes. Image of Artemis in Greek mythology is dual, that corresponds to numerological principle of number 2 which in the context of Pythagorean numerology is esoteric symbol of polar structure of universe or otherwise to tell discrete world validity. Light mythological image of Artemis rules over vital forces of nature and is similar to Apollo, because these Greek deities are twins. Dark mythological image of Artemis is personification of uncontrollable vital forces of savage nature. Light Artemis is virgin and protects chastity, namely young girl who should keep virginity. Dark Artemis personifies productive forces of prolific nature, namely adult woman who is intended for childbirth. Artemis gives birth to children according to call of nature and natural biological laws of life, that differs from characteristics of Hera and Leto who aspire to motherhood for social status and substantial position in Olympic hierarchy, or differs from parameters of Demeter who creates family for genetic continuation of generations. This mythological Greek goddess is cousin of Artemis, because mother of Hecate is Asteria who is native sister of Leto. Both Greek goddesses Hecate and Artemis are grand daughters of titan Coeus and titaness Phoebe who correspond to zodiacal signs Leo and Crab where dominating heavenly bodies are Sun and Moon. Image of Hecate in Greek myths is commensurable with psychological characteristics of Artemis and too is dual. Light image of Hecate personifies night hunter and symbolizes glimmer flame or fire of burning torch. Dark image of Hecate is personification of night gloom and sorcery, or otherwise to tell unobvious illusions which arise in darkness. Retinue of goddess Hecate is monstrous Empusa who appears to people as vision of fine girl which transmutes into horrifying phantom. Hecate at birth time has received great power from Gaia and primary potentialities of universe, and consequently this goddess of Greek myths possesses divine energy which allows to rule over vital forces of nature. Hecate has divine rights to predetermine destiny and life events of future children, because she connects men and women, also promotes realization of biological evolution and breeding of animals. Hecate gives knowledge about miraculous grasses and herbal plants which are components of healing remedies or magic medicines. 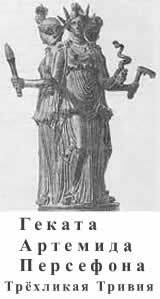 Hecate is mythological deity of "three roads", because people worshipped this Greek goddess on cross-roads at midnight by means of magic rituals and magical spells which was intended for meetings of loving couples, or otherwise to tell for acquaintance of woman with man. Dark image of Hecate is personification of love magic and sorcery which is focused on initiation of fear which raises sexual attraction and sensual desires. Light image of Hecate is personification of love magic and sorcery which is focused on clearing of fear which suppresses sexual attraction and interfere sensual desires. Otherwise it is possible to tell that light image of Hecate is fearless and shines darkness of unconscious sensual desires with luminous flame of burning fire. But dark image is personification of night horror and unconscious sensual aspiration to loving conjoin of women with men. Hecate symbolizes natural sexual attraction and sensual instincts, that differs from immoral desires of Dionysus who is participating to vulgar orgies of satyrs and bacchants. Also natural sexual instincts of Greek goddess Hecate differ from aspiration to ideal love which is peculiar to Apollo. Alongside with love magic this Greek goddess is divine intermediary between alive people and empire of death, because she makes visible phantoms of died human beings. Somewhat Hecate can be compared to Hermes who too is divine intermediary between alive people and lifeless empire of death. But image of Hermes personifies secret esoteric knowledge and mystical occult doctrines, or otherwise to tell mythological deity of occultism, that corresponds with number 3 of Pythagorean numerology, but Hecate is goddess of magical sorcery. Also Greek goddess Persephone is divine intermediary between physical space of alive people and lifeless empire of death, because she is wife of Hades. Persephone has been stolen by supreme ruler of underground empire of death, and she has been compelled to become wife of Hades, but she exists in gloomy world of own husband only during winter and comes back in space of alive people at spring, that symbolizes vernal awakening the nature and growth of plants. Namely mythological image of Persephone too is dual. Light image of Persephone personifies wildlife and growth of plants, that is equivalent to characteristics of Artemis. Dark image of Persephone personifies night and horror of death, that is equivalent to characteristics of Hecate. In total mythological images of Persephone, Artemis and Hecate can be correlate with astronomical compositions according to which Moon is interconnected with Earth and Sun in space of solar system. And in essence mythological images of three goddesses can be correlated to various astrological positions of Moon in horoscopes or natal charts which are symbolical maps of solar system. Day Moon or visible heavenly body in the sky after sunrise above horizon in horoscopes corresponds with light image of Artemis. Night Moon or visible heavenly body in the sky after sunset under horizon in horoscopes corresponds with dark image of Artemis. Time of new moon or astronomical period of invisible moonlight, also connection of lunar position with Sun in horoscopes correspond to dark image of Persephone. Time of full moon or astronomical period of visible moonlight, also opposition of lunar position in relation to Sun in horoscopes correspond to light image of Persephone. White Moon in horoscopes corresponds to light image of Hecate. Black Moon in horoscopes corresponds to dark image of Hecate. Position of black moon in astrology is astronomical point of apogee or celestial value of lunar orbit when Moon most removed from the Earth. Position of white moon in astrology is astronomical point of perigee or celestial value of lunar orbit when Moon most approached to the Earth. In total three Greek goddesses Hecate, Artemis and Persephone correspond with three-faced Roman goddess Trivia who can be considered as complex astronomical compositions according to which orbital movement of Moon is interconnected with Earth and Sun in heavenly space of solar system. It is possible to tell that Roman goddess Trivia is complex union of Hecate, Artemis and Persephone, also is personification of various points of lunar orbit and positions of Moon in astrological horoscopes. Or three Greek goddesses Hecate, Artemis and Persephone in aggregate with Apollo and Dionysus are commensurable with deities which in mythology of ancient Greece personified images of Sun and Moon, also morning light of dawn, namely divine essences which were born as children of titan Hyperion and titaness Theia. Helios is mythological image of the Sun. Selene is mythological image of the Moon. Eos is mythological image of morning dawn, namely goddess who personifies sunrise above line of horizon and axis of ascendant in horoscopes. Selene above line of horizon corresponds with day Moon and light image of Artemis. Selene under line of horizon corresponds with night Moon and dark image of Artemis. Helios above line of horizon corresponds with day time Sun, also light images of Apollo and Dionysus. Helios under line of horizon corresponds with dark images of Dionysus and Apollo, also invisible Sun which exists in underground empire of death when night begins on surface of the Earth. If heavenly bodies of Helios and Selene are in one point of celestial vault then correspond with time of new moon and dark image of Persephone which exists in lifeless empire of death. If heavenly bodies of Helios and Selene are in opposite points of celestial vault then correspond to time of full moon and light image of Persephone which exists in the kingdom of wildlife. General set of Selene, Helios and Eos forms complex interrelations with Greek gods which correspond to numbers 2 and 8 in the context of Pythagorean numerology. Helios is connected with Apollo and Artemis who are twins. Selene is connected with Dionysus and Persephone who are brother and sister. Eos is connected with Hecate who is cousin of Apollo and Artemis. Following page considers Greek mythological gods Hermes and Aphrodite who correspond with numbers 3 and 9 of Pythagorean numerology.